The threats are real and these photos should alarm you! 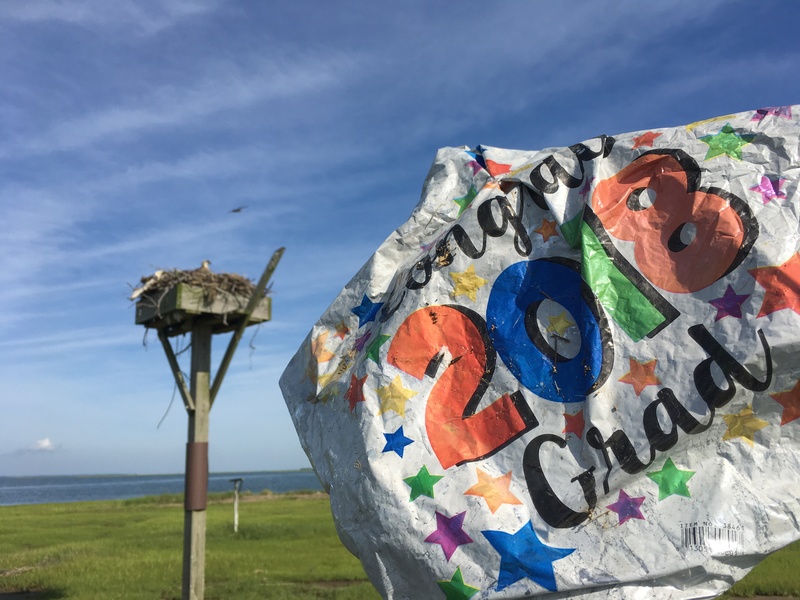 Shortly after spring arrival to their breeding grounds, ospreys are being welcomed with plastics, like this adult on its nest in Bayville, NJ. photo by Bev Morris. The alarming trend is also becoming more deadly for ospreys, and other marine life who ingest it. 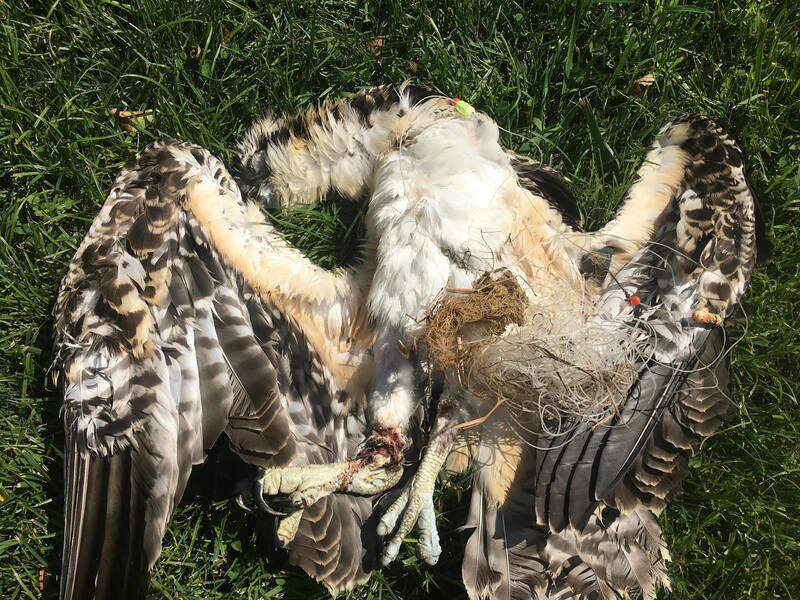 While it might not seem like a lot, this year a total of four young ospreys were found dead from being entangled in plastic. In my books, one dead osprey is too many! This is not a natural cause of death! Luckily, there were several other entanglements that were prevented, but this trend is likely to get worse. We hope that these photos will help you to do all that you can to help prevent it from becoming a growing threat to ospreys and other marine wildlife, who might ingest plastics. Adult female osprey with white balloon ribbon wrapped around her leg. April, 2018. photo by Northside Jim. From the land, where they collect nesting material, to the water, where they forage for prey. The growing presence of plastics on land and in water, highlights need to restrict single use plastics, balloon releases, and for any single use plastic fee to directly fund cleanups of plastic waste. It’s no surprise that ospreys use plastic items in their nests. It’s now become a common resource for them which looks similar to natural nesting material and collects in the same areas where they gather nest material. 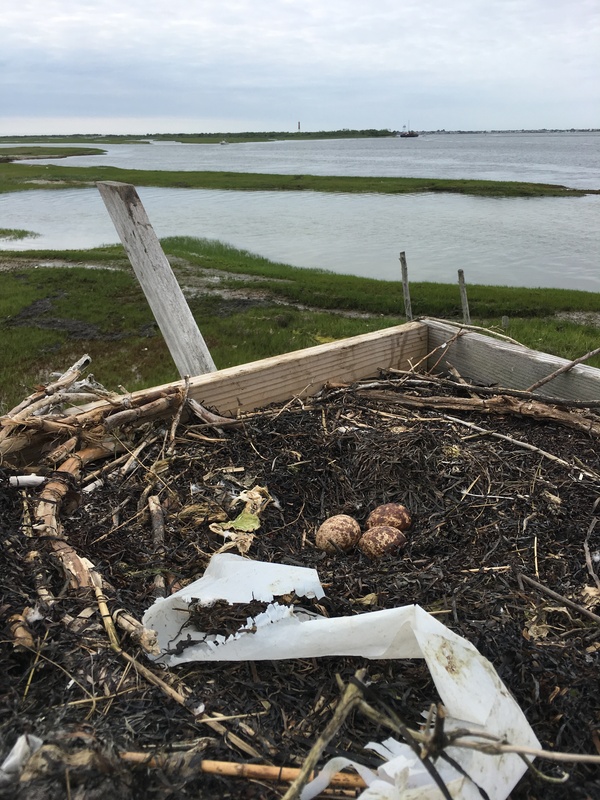 The more plastics in the world means more plastics in osprey nests! When out on the marsh or on the beach, if you look around you’ll find plastic. According to the Clean Ocean Action 2017 Beach Sweep report (for the first time since the sweeps began in 1985) 84.45% of items collected on the beach were plastic (including foam). Another alarming trend is the growth in balloons found on the beach. In 2017, a total of 4,137 were found. Next time your down the shore, try to determine the difference between a white single use plastic bag and bleached sea lettuce, or white balloon ribbon and bleached eelgrass… Please don’t ever release balloons! The most deadly piece of plastic litter for ospreys this year was monofilament or fishing line. The four ospreys that were found dead died from being entangled in monofilament. Fishing line is typically brought into a nest while attached to a stick or branch. It then becomes part of the nest and can easily get wrapped around a nestlings leg, foot or wing. This is not an isolated event. It happens throughout the range of ospreys (here are just a few that made the news). Please dispose of your fishing line appropriately! Single strand monofilament can even be collected and mailed to Berkley (a manufacturer of fishing line) for recycling/reuse! Never release balloons! Talk to your friends/family about where balloons actually wind up. Reduce your dependence/consumption of single use plastics: bring your own reusable bag, water bottle, and coffee cups. Buy beverages in glass or aluminum containers. When eating out or getting take out, ask for no single use plastic items and/or bring your own container for leftovers. Support a Surfrider Foundation Ocean Friendly Restaurant! Reuse or repurpose things that can’t be recycled. Opt into free recycling programs for hard to recycle items through Terracycle, a NJ based waste reduction company. Pick up plastic litter. Participate in coastal cleanups (the next COA Beach Sweep is on 10/20!). Dispose of trash responsibly. Thank you to all of our volunteers, especially our Osprey Project Banders, and those who’ve helped to reduce plastic debris in our environment! This entry was posted on Wednesday, September 26th, 2018 at 12:00 pm	and is filed under Birds, Get Involved, osprey, Raptors, Wildlife Protection. You can follow any responses to this entry through the RSS 2.0 feed. Both comments and pings are currently closed. Hi Ben, Thanks for this very sobering blog piece. I’ve shared it with fellow osprey enthusiasts around the world as it really is a global epidemic which could, with the right amount of effort and thought, be totally eradicated. Thank you for the information in your blog report. I have passed it along to the Jerseybirds subscribers list. 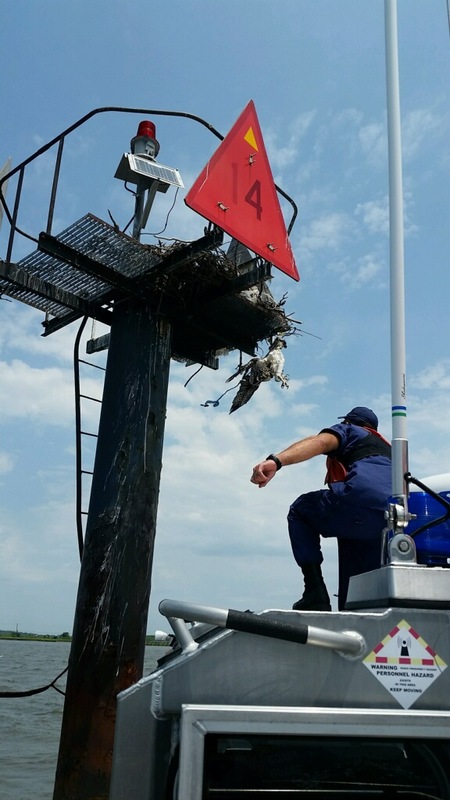 Thank you as always for all your hard work for the Ospreys and all wildlife in New Jersey. Sometimes it is difficult to be hopeful…. Thanks for this, sharing with everyone I know. Hey Lisa, Thanks for the kind words. You are right. If we all did a little on a global scale, then it would make a huge difference. Your support is much appreciated! Thank you, Wendy! Yeah, we can only hope that by sharing some of these disturbing scenes, it will help bring more awareness to this ever growing challenge for future generations to deal with. Hey Joe, You are right. They are very disturbing photos. Photos that we hope will spur some action by those who might not have been concerned as we are with the amount of plastic debris we find while working in our tidal saltmarshes. The channel marker nestling did not make it. The adult who had ribbon around her leg did get free. We can only hope that these scenes don’t become more prevalent in the future.